DETROIT (WWJ) – The Salvation Army put the metal to the kettle Thursday morning in Campus Martius Park. What’s billed as the world’s tallest red kettle was lowered into place, a symbol of the organization’s annual holiday fundraising drive. 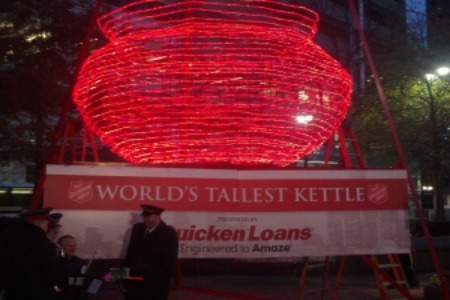 The giant red kettle, which was constructed by Wayne State University students, is approximately 56-feet tall, 24-feet wide and contains 25,000 red LEDs. Anderson said despite an upswing in the local economy, the need for assistance is still great. “What used to be is no longer and we’re seeing a whole shift in individuals that we’re helping. In other words, we’re heading to the suburbs, we’re heading to places that we’ve never been before, helping families that never thought they would need our help. It’s not just the inner city, and I’ll tell you, it is a big deal to us that every individual is cared for,” he said. This season, The Salvation Army is raising their fundraising goal in order to help as many people as possible. “This year’s goal is $8.5 million, which is about a $300,000 increase over last year. We’re very optimistic. We reached the goal last year, you know, we had to work a little bit at it, but that’s a good thing. We like to work at it, we like to get the energy behind it and make something happen,” said Anderson. This past year, The Salvation Army of Metro Detroit was involved in providing 3,220,937 meals and 677,051 nights of shelter for the homeless. The Salvation Army uses $.85 of every dollar raised to provide direct services to people in need each and every day of the year. For more information about The Salvation Army, and to volunteer to be a bell-ringer, visit www.salmich.org or call 877-SAL-MICH.